Recently, a student told me about how a graduating senior claimed that she couldn’t be a writer until she read War And Peace. My first reaction was to roll my eyes and ask if he had read it. Apparently, he was only halfway through the book. Obviously the unnamed senior was wrong; people had been writing great works of literature for millennia before Tolstoy sat down to write the first words of his famous tome. However, I kept wondering about the senior and his reasons for making such a snobbish statement. Maybe he was trying to express how this book was revolutionizing his view of writing, and in his excitement made an overgeneralization. Maybe he was repeating something that a personal hero had said; I’ve known of tons of people claim that you can’t write “until you see the world,” “until you learn to depend on yourself,” “until you get your heart broken” and so on. And maybe, he was just a jerk who felt threatened by my student’s intelligence and talent and was trying to make himself feel better by putting her down. 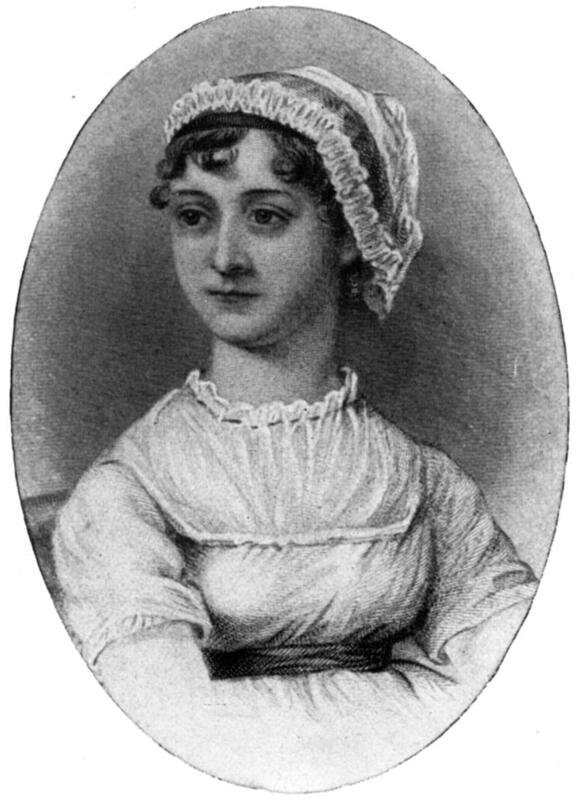 Jane Austen: someone else who never read War and Peace. This is a common story. I’ve had a student who was brilliant and articulate but paralyzed herself with panic whenever she had to write because a teacher had said, “Please, don’t ever write again.” I’ve been in workshops where my fellow students’ critiques were something along the lines of “this subject matter isn’t worthy of a poem.” I’ve had strangers come up to me and tell me not to waste my time “reading that trash” (Jane Austin and Jack Kerouac). There are many creative writing teachers who forbid students from writing in genre or about a particular topic. All in all, we’re regularly told what we can’t write, and often we’re told that we’re not even writers. After a while we start telling ourselves that we’re not writers, which is ridiculous. We’re always going to find someone who is more than willing to tell us that we’re not a writer. Someone who is more than happy to point out that what we’ve written doesn’t really count. The best thing that I’ve ever done was to ignore (or at least actively try to ignore) them. Today, I suggest you think about that subject matter, that genre, that form or lack of form, that thing that you’ve been avoiding writing about because it doesn’t count, and, of course, write about it. If it helps, know that you’re under no obligation to show it to anyone, as Bob advised in Monday’s post. Yet also remember, you don’t have to keep it hidden—if you’re proud of something that “breaks the rules” share it with the world. When you leave the familiar, you face not just the unknown but the possibility of something going wrong. Your car could get a flat tire on a lonely stretch of road. You could become lost. You could meet some people who only wish you harm. There is a reason Little Red Riding Hood is one of the most beloved fairy tales despite never getting a feature-length Disney adaptation. The heroine is warned to never leave the path. These warnings are worth heeding. At the same time, sticking to the familiar path ensures that you will never turn a corner and discover something beautiful, interesting, or confounding. How many side streets do you drive past every day without turning down them? Yes, most of the neighborhoods look the same, but sometimes you discover a park with a cool public sculpture, a house covered in brightly colored tile, a tree where someone carved Our Lady of Guadalupe. There is a reason that many people would rather risk a hole-in-the-wall restaurant rather than eat at a chain restaurant again. Lately, I’ve been working on this Thing. I refuse to define it as anything more than prose. Someone asked if it is a story, and, while it has characters, I hesitate to call it a story as I’ve yet to find the plot. I’ve already filled 1 ½ small legal pads, so I’ve done quite a bit of writing. I resist defining what it is, because once I do the Thing will become constrained by the boundaries of that definition. Maybe it will be a novel or novella and I still have a long way to go. Maybe it’ll be a short story, and I’m just starting with the characters rather than plot this time. Maybe I’ll cut the majority of my writing, and it’ll be a flash fiction. Maybe it’ll lead me to an idea for a poem, and I’ll leave behind all the prose. Maybe, and this is what terrifies me, it’ll develop into nothing—the characters will never find their plot and remain half-fleshed out. Usually when I’m writing, I have a set path—I know what I’m writing. If I set out to write a poem about X, I usually write a poem about X. Oh, I’ll discover new things on the way and will often get to my destination differently than had I expected, but I know roughly where I’m going. Yes, sometimes a seven page poem will become a sonnet, and other times a flash fiction piece will grow into an actual short story. On a few occasions, a piece has even shifted genres on me, but I always start with the confidence that I know where I’m going, even if turn out to be wrong in the end. As I work on the Thing, I just don’t have any idea where I’m going. While I always feel fear and a gnawing self-doubt when I sit down to write, these unknowns multiply those anxieties. Am I just wasting my time creating melodramatic trash? Am I biting off more than I can chew? Shouldn’t I focus on something else? How will I know when I’m done? Am I condemning myself to writing for an eternity about two characters who refuse to find a story or point of some kind? It is tempting to put the Thing away and focus more on my other projects—projects that I can define in conversations. Yet, I’ll never know where the Thing will lead me if I stop. It could have become my first draft of a novel or a really dense prose poem—and I’m willing to risk a dead-end to know where this road goes. There are much worse things than dead ends. It’s not like the Thing is going to transform into an unstoppable monster. Right? There are three things that you should know about me up front. First, my first (second, third, and fourth) drafts are almost always terrible. There are a few exceptions, but I know every time I sit down to write a poem that I will probably go through ten to thirty drafts. The second thing you should know about me is that I have no rhythm. Have you ever been annoyed at a live performance by someone clapping out of time to the song? That was me. This lack of rhythm means that trying to handle formal elements like meter and rhyme can be particularly stressful. The third thing is that in high school and my first years of college, I liked to sew Victorian costumes. You can just tell he thinks in iambic pentameter. Some people have a natural rhythm, so meter and rhyme comes easily. For those of us who struggle with form, it seems to belong to a spiritual realm where poets in waistcoats walk along green landscapes chatting with their muses. The type of place that probably has a tall fence to keep riff raff like us out. For a while, I told myself that I was better off without all these formal skills. Yet my jealous nature got the better of me, and I wanted to show these imagined literati that I could use traditional forms too. My first attempt at sonnets and ballads were awful. The rhyme was obvious and clichéd, each line ending like a cymbal crash. I could never keep the meter going more than a line, and those lines tediously marched on. Part of the power of form is building the readers’ expectations and then breaking them, but I couldn’t even build those expectations. Those early attempts remind me of pictures of bustles with no skirt over them: all shape but no content. I made a bustle once. It was not historically accurate. Instead of working with wire or complex ruffles, I used PVC pipe. The thing was admittedly the Frankenstein monster of undergarments, but throw a skirt over it and it looked fine. It gave the garment structure, but wasn’t what drew attention, which is how the formal elements of a poem should work. Form can tighten or extend a poem, but if the main thing that your reader notices about it is that it’s a sonnet, the poem is only half-dressed. Once I realized this, I started to only use form where the reader could not see it—in my early drafts. I had a poem once that was three pages long, and none of it worked. I decided to turn it into a sonnet. By trying to fit three pages into fourteen lines, I cut what was unnecessary. There was another poem where I was only touching the surface of the topic, but I resisted diving deeper into the subject. I decided to structure it like Anglo-Saxon verse. In trying to get every line to have four stresses, a caesura, and an alliterative structure, I expanded this poem and forced myself into those places I had been avoiding. I then revised the poem several times and the finished version is most definitely free verse. If you’re a free verse poet you don’t have to start writing poems in traditional forms. But whenever you find yourself stuck with a draft that seems to be going nowhere, those forms can give you a new way to approach a poem. After rewriting the poem in short measure or heroic couplets you may see where you need to go in the next draft. In a way form allows you to stop thinking about meaning and to just write. In that new writing, you may have found the right path to follow. You may even find yourself getting comfortable with things like meter or rhyme. Take a poem that you need to cut down. Select a short form, such as a sonnet, rondel, triolet, or, if you’re feeling particularly brave, a haiku, and rewrite your poem. Let your poem sit for a few days, then revise if necessary. Take a poem you need to expand. Select a long form or a form with no set length, such as chant royal, sonnet redouble, terza rima, or blank verse, and rewrite your poem. Let your poem sit for a few days, then revise if necessary. Take a poem you have been unsure of what to do with. Select a form that makes use of repetition, such as villanelle, sestina, or pantoum, and rewrite it. Let your poem sit for a few days, then revise if necessary.